A pied kingfisher hovers, its head angled down to watch a fish that cannot see its lofty predator. The kingfisher dives. When the bird’s bill parts the water, the fish detects sound waves and has half a second to dodge the dagger-like bill. If the kingfisher’s timing is exactly right, it has a meal. 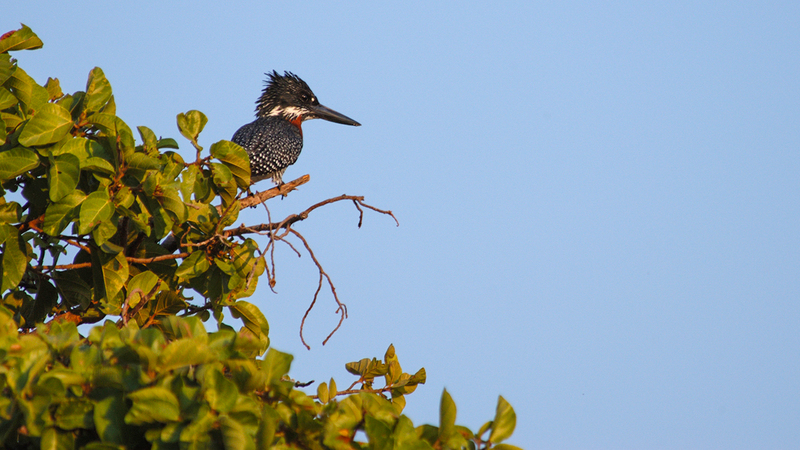 Where does the pied kingfisher lay its eggs? In large nests constructed on the tops of river rocks. In mud banks or sand banks. On low-hanging branches of fever trees along the river. In mud banks or sand banks. Breeders burrow deep into the banks, digging a long tunnel that ends in a chamber where three to six eggs are laid. Pied kingfishers live in pairs or in small family groups. 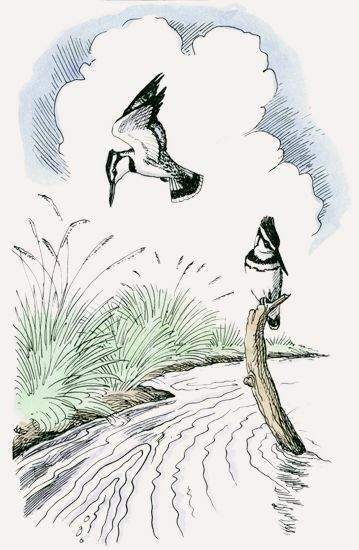 The call of the pied kingfisher is a musical chit-chit, which often is picked up by others in the group. Because these open-water hunters can swallow small prey in flight, they do not need the waterside perches required by other kinds of kingfishers. This fast-food skill enables the pied kingfisher to hunt as far as 12 miles (20 km) from shore. Pied kingfishers live mainly on fish, but they also consume crustaceans and large aquatic insects. Breeders burrow into vertical mud banks or sand banks, digging a long tunnel that ends in a chamber where three to six eggs are laid. 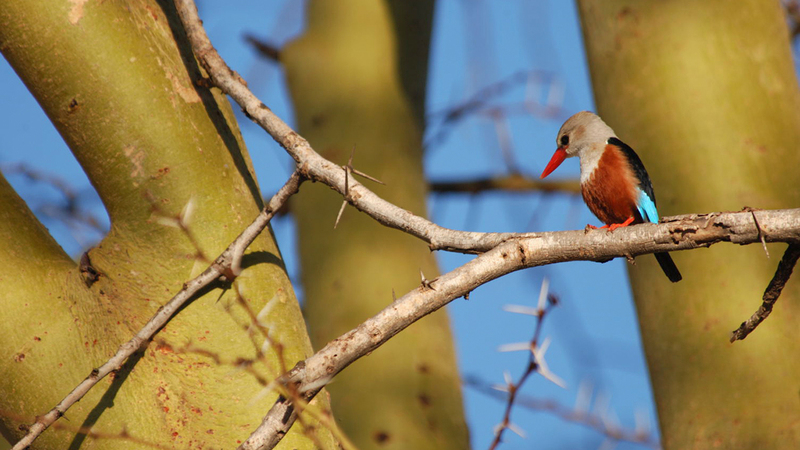 Birds from the breeding pair’s earlier broods sometimes assist their parents, as do older birds that are not related. Chicks leave the nest in about 25 days. Adults and young are preyed on by cobras, mongooses, and small predatory mammals. 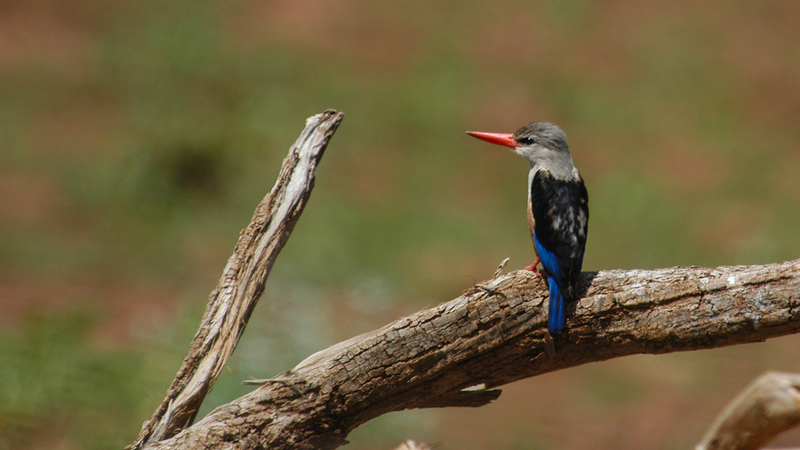 Pied kingfishers are found throughout southern Kenya and along the shores of Lake Turkana. 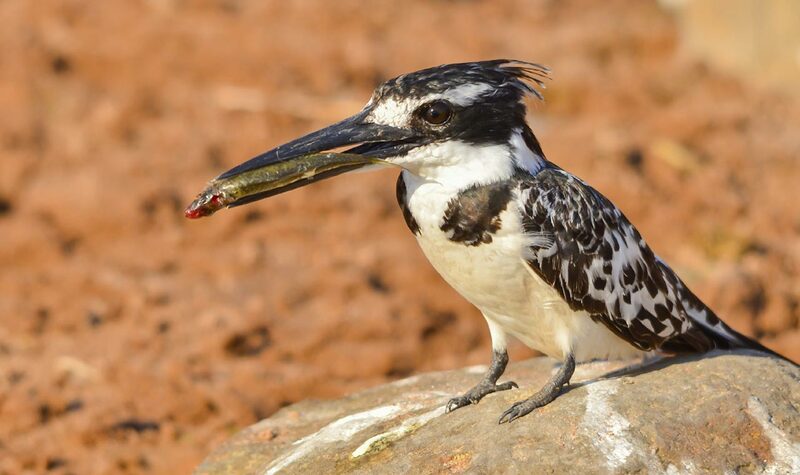 Pied kingfishers live throughout sub-Saharan Africa near water, including coastal shallows, creeks, lakes, and rivers, from sea level to 7,500 feet (2,300 m). ​Pied kingfishers are great hoverers as well as speedy fliers. They have been clocked at nearly 32 miles per hour (51.5 kph) to reach a fishing site.